The Dubuque Bald Eagle Watch will be held on Saturday, January 19 from 9:00 a.m. to 4:30 p.m. in the Grand River Center in the Port of Dubuque. Enjoy live raptor presentations and meet other people who love nature and wildlife during a free family event organized by the Dubuque Audubon Society. Our club will have an informational table in the vendor area, including a slide show of member photos. Club members, contact Ron if you would like to display your nature-related prints. 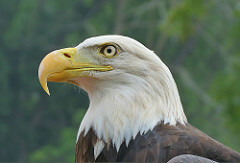 This FREE family event celebrates the American Bald Eagle with live bird programs and children’s activities. Vendors will have wildlife art, books, and nature items available for purchase. Exhibitors will share information about opportunities to experience nature in the Tri-State area. Natural resource agencies and organizations will be there with educational displays and information. There will also be vendors selling nature related items. Catch the FREE Jule shuttle leaving every 20 minutes from the Grand River Center to Lock and Dam#11 for LIVE eagle viewing. Park at the Grand River Center and hop on the shuttle to get the full experience of the Eagle Watch, using an environmentally friendly mode of transportation. Shuttle pickup/drop off times will be posted at each spot. See back for maps and programming.